Apple Bourbon Moscow Mule Recipe, served up in gorgeous copper mugs. I find that there is nothing better than to serve for the holidays than Moscow Mules in copper mugs!! 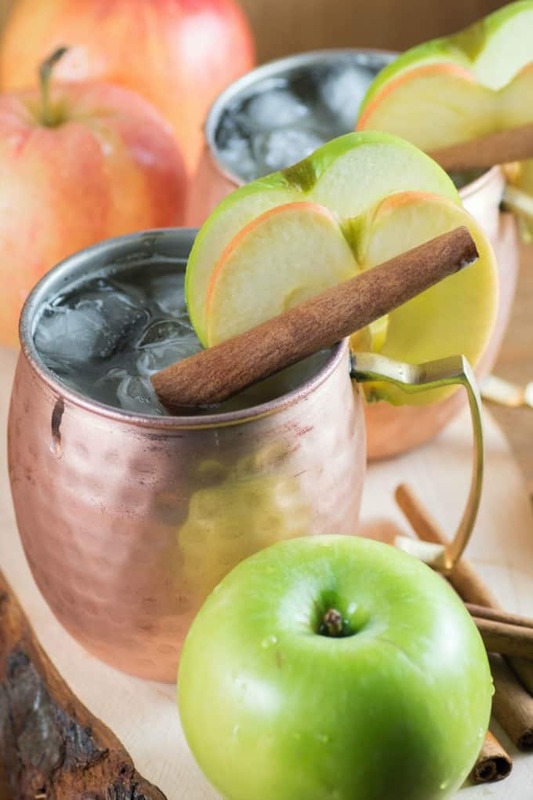 And what better way than to amp up a Moscow Mule into something other than the traditional cocktail than an Apple Bourbon Moscow Mule Recipe. This is an absolute winner of a cocktail and one that can be enjoyed well past Christmas too. 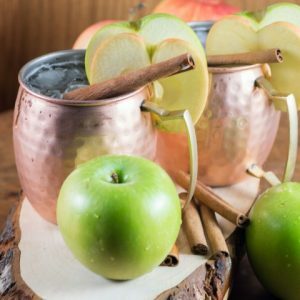 We love serving up Moscow Mules and our Cranberry Moscow Mule is also a very popular cocktail for the holidays. With today’s post we have a wonderful giveaway also! You can win a set of two Moscow Muled mugs to try this wonderful cocktail in! These mugs are stunningly handcrafted and made with 100% pure high-grade and food-safe copper. All of Moscow Muled copper mugs are lined with nickel. It’s very important that your copper mug is lined with nickel. That’s because copper is a heavy metal that reacts with acidic fluids such as cocktail ingredients. If you use a copper mug that is not lined with nickel, the acidic fluids in your drink will cause a chemical reaction which may cause you to ingest too much copper, leading to an unhealthy and potentially dangerous concentration of copper in your body. Not all copper mugs are considered equal. 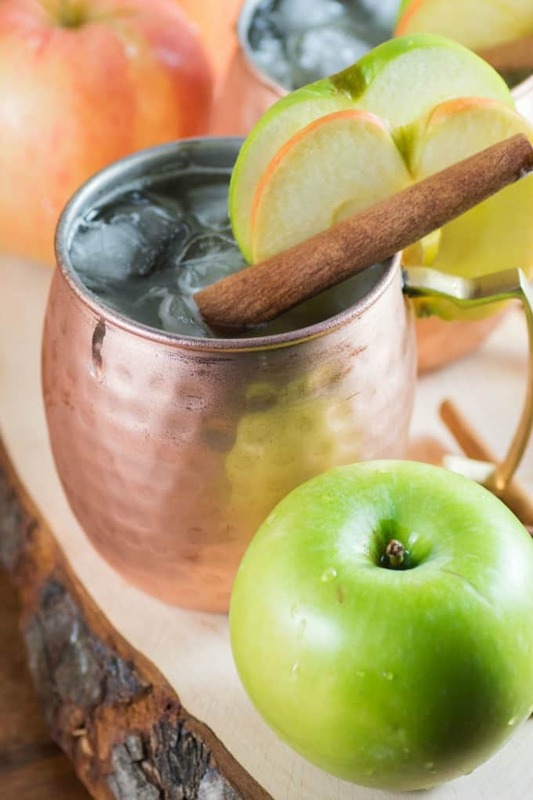 At Moscow Muled their copper mugs are 100% handcrafted with care using traditional methods. You will see this in the quality of these mugs. Their mugs are also carefully and painstakingly hammered by hand to create a gorgeous aesthetic. Every mug will be unique and may have some imperfections which add to the character of the piece. They are of exceptional quality. Unfortunately, many other manufacturers (mostly those based in India and selling on Amazon, Ebay and Etsy) falsely claim to sell pure copper mugs that are actually plain metal mugs plated with copper. The copper plating will start to rub off these mugs after only a few months of use. 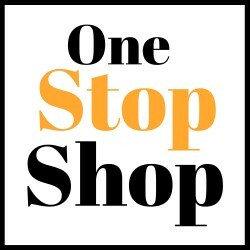 Many of their customers came to them and bought their copper mugs after having a bad experience with one of these manufactures. While these manufacturers are able to offer their mugs for sale at a lower price than their mugs, they are not the real thing! What is the Best Recipe for a Moscow Mule? An original moscow mule recipe is made with vodka, ginger beer, lime juice and a wedge of lime over ice. There are many other Moscow Mule recipe variations though! Although our Cranberry Moscow Mule recipe is much more traditional with vodka and ginger beer we also added in cranberry juice along with frozen cranberries. We started to think outside the box for this cocktail that we have for you today. I wanted even more holiday flavors and went for delicious apple juice and bourbon blended together. I used for this recipe a really good organic freshly squeezed apple juice that gives you tons of flavor also. The apple juice blends perfectly with the ginger beer and the bourbon giving you a fantastic fall/holiday libation. These mugs would be the perfect gift for the holidays. Bring along two as a hostess gift or give a set as a present. Giving a spouse a gift like this has you enjoying them also!! Both men and women love the look of copper. Care of the mugs is easy! If you don’t like them to naturally have their own patina then simply sprinkle a pinch of salt on a slice of lemon, allow the salt to dissolve, and then gently rub it on the surface of your mug. The lemon and salt will form a mixture that will naturally remove the patina and therefore restore the copper’s shine. Once done, rinse with water and dry well. Follow along with the fun at Moscow Muled on Facebook, Pinterest, Twitter and Instagram. The giveaway is open to Canada and mainland US for two Moscow Muled copper mugs. Contest will be open until October 15, 2018 at 12:00 am at which time a random winner will be chosen. When the winner is selected they have 48 hours to respond to the email or a new winner will be chosen. 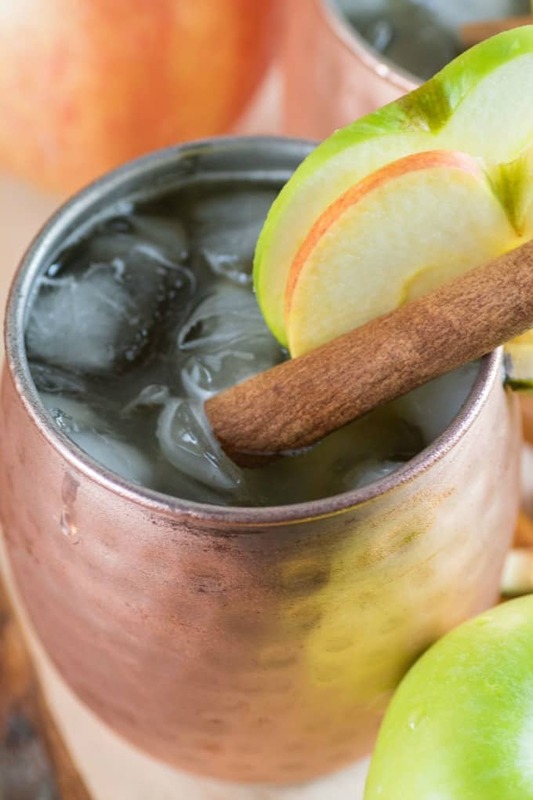 This Apple Bourbon Moscow Mule Recipe takes this classic cocktail to a whole new level. Perfect for the holidays too! In a Moscow Muled copper mug pour all the ingredients over ice. Stir well and garnish with apple slices. I’d love to try this in my new copper Moscow Mule mug! I wonder how it would be with Calvados instead of bourbon? I bet very yummy too! That sounds like an awesome drink. It’s perfect for the little party I’m having this weekend. These mugs sound fantastic. It would be nice to have a couple around for special drinks like this. Perfect for fall! I LOVE moscow mules! They just feel so fancy but also rustic. I can’t wait to make this one. 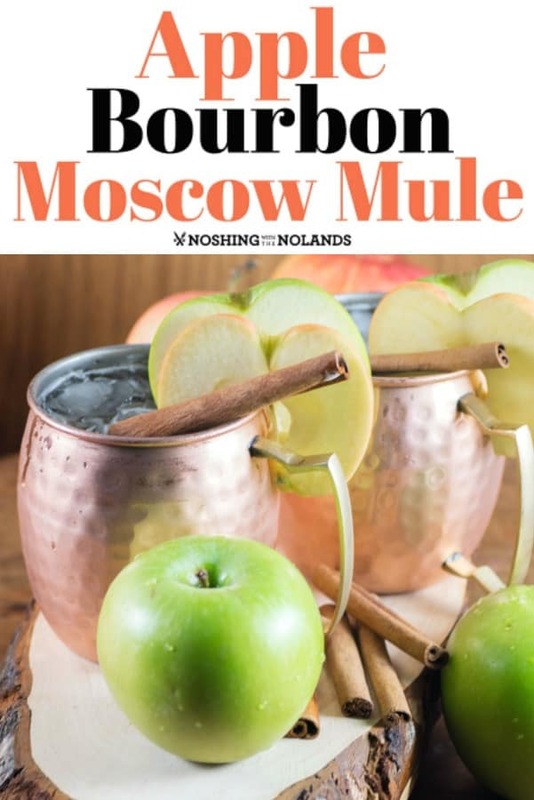 I have never had a moscow mule and generally don’t drink bourbon but this sounds so good. The copper mugs are a great way to enjoy a nice drink. This is the most fall of fall cocktails ever. I love the flavors, and even the copper cup just feels like fall to me. It’s wonderful. I am so on my way right now! hehe! This looks absolutely incredible and perfect for fall weather, too. I’m not a huge bourbon fan, but I bet it would taste amazing in this drink. I can’t wait to try it. I love your twist on the Moscow Mule. We’ve made it a tradition to have Moscow Mules for the Super Bowl. Apple Bourbon would be a nice change of pace while sticking to our copper mug game drink! This looks delicious! I could go for one of these drinks right now too. I’ll have to grab the ingredients so I can make some! Either Cranberry or Apple would put anyone in the “Holiday Spirit”–especially served in these beautiful mugs!!! Every kitchen should have a pair of Moscow Mule mugs. I think I will have to give this twist a try. This is calling my name! Sounds great to try his weekend! Love your recipe so much! I can’t wait to try it next weekend! First of all, I am not a drinker. However, I am loving that mug. This is the perfect fall cocktail! I am so trying it soon! Is the ginger beer alcoholic as well? Ginger beer is non-alcoholic and is like ginger ale but has a much much more intense ginger flavor. I find it best served as a cocktail or a mocktail. Here is another popular recipe we have using it, https://noshingwiththenolands.com/cranberry-moscow-mule/. Cheers!! I’d try the cranberry moscow mule!